The effects of Hurricane Marie, a Category 5 hurricane in the Northwest Pacific on Aug. 21, were felt along the Southern California coastline, Aug. 26 to 28, as huge waves pummeled harbors such as Avalon Harbor and Santa Barbara Island. 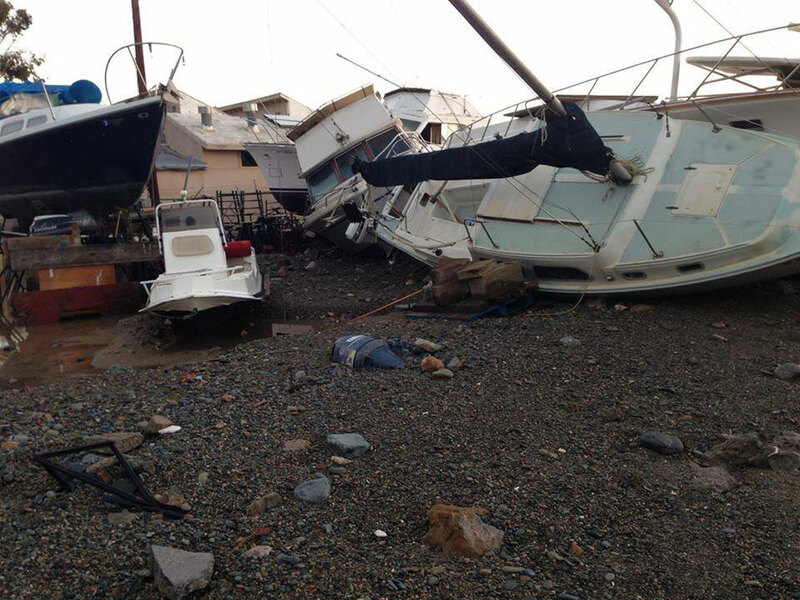 On Catalina Island, Pebbly Beach Boat Yard experienced damage when strong surges rocked boats, snapped boats from moorings and knocked vessels off their jack stands. “The boat yard at Pebbly Beach, which is a mile east of Avalon, is where we got the brunt of the storm,” said Avalon Harbormaster Brian Bray. Bray explained that the south breaking swells hit the facility tossing boats around on the privately owned parcel. Back at Avalon, four Harbor Patrol officers began to prepare for the large swells the night before by lowering the ramps located on the pier, removed the dinghy docks, secured other docks and released the pumpout float as to avoid any damage to the ramps. There were a few mooring lines that snapped but no damage. By Friday, Aug. 29, the island was back to business as usual, Bray said. Debris was still coming into the harbor from Whites Landing and Camp Fox at press time. In Newport Beach, high surf resulted in more than 50,000 visitors at the Balboa Peninsula to witness the large waves, according to the city’s public information office. Newport Beach Lifeguards made 73 rescues as waves surged 6 to 8 feet in height. It was estimated that waves peaked at 12 to 15 feet on Thursday, Aug. 28. Chief Lifeguard Rob Williams warned visitors to stay away from the water and recommended only “highly experienced swimmers” should enter the water during this time. Harbor Patrol officers in Ventura Harbor responded to five calls to assist State Lifeguards who were busy due to the strong surf. No boating incidents were related to the waves, said Ventura Harbormaster Scott Miller. “In three of those calls, we took victims aboard our boat and transported them to safer locations,” Miller said. Vessel operations at the Port of Long Beach were suspended at two cargo terminals due to the waves that endangered longshore workers. Total Terminals International on Pier T, and Crescent Terminals on Pier F, were closed Tuesday, Aug. 26, according to the port. Flooding was reported at Crescent. The surges were so powerful on Aug. 27 that heavy rocks from the Navy Mole breakwater were tossed onto the nearby roadway with road damage reported on Nimitz Road near the Sea Launch satellite-launch vessels, closing the roadway. The port also reported that two barges broke loose from their anchorage overnight on Aug. 27, and were later towed and docked at berths T136 and T134. A pleasure craft also had to be towed to safety. Cargo operations resumed, Thursday, Aug. 28. On Aug. 28, Channel Islands National Park announced the closure of Santa Barbara Island due to storm damage. According to the advisory, several pilings were damaged on the landing dock and the pier’s landing ladder was washed away. Closure of the southernmost and smallest of the islands within Channel Islands National Park is expected to last more than a month to allow time for the dock to be repaired and a new ladder to be attached. This is the island’s second closure of the year due to a storm surge, according to park officials.